Lonnie Allgood, NFL All-Star and CEO Dreams for Kids, Inc.
Best Fundraiser in New York/ New Jersey! www.ladfk.org Dreams for Kids is a passionate 501-c3 non-profit organization committed to helping kids reach their dreams in life. Lonnie Allgood is the founder and he works tirelessly on his mission is to help build a child's character by giving them the tools they need to believe in them and respect others. Through interaction with current and former professional athletes as mentors we want children to understand the importance of education and inspire them to become great people in society. Dare to Dream is designed to reach adolescents form ages 7 to 18 years of age, when children are more vulnerable to peer pressure. It is an educational support program that concentrates on providing the maturing adolescent with valuable information about life experiences. Our program utilizes the experience and insight of professional athletes, entertainers, business and community leaders as role models for the youth of today. 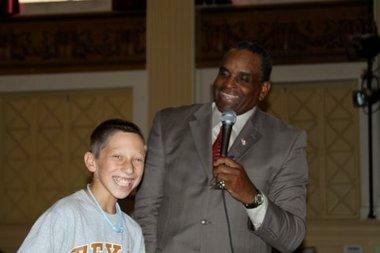 Lonnie coordinates NFL Celebrity appearances, speaking engagements, assemblies and camps. But what I love most is his FUN-DRAISER! Scoring Points for Kids is a fundraising program where they team up with schools, charities, churches, and other community non-profits to meet their fundraising needs and provide fun for everyone who gets involved. Your audience will shout, laugh, jump and applaud as our all-star team of NFL players takes on the teachers, police officers, government officials, and children of your community for a fast-paced FUN basketball game. Ticket sales, food concessions, sports memorabilia sales, autograph sessions, and half-time contest generate revenue. The BEST part is there is no money needed upfront! Lonnie simply works tirelessly for your school and you split the profits 50/50 after the event! I've seen it in action and it is AWESOME! What's Hot With After School Programming? Are Club Sports Worth It?